Developing a shared understanding of their business and life on the farm were key benefits Chris and Sally Guy took from entering the 2018 Auckland/Hauraki Dairy Industry Awards. First time entrants, the young farming couple recently took top honours for the region’s Share Farmer of the year competition and then went on to achieve second placing in the national competition. Their regional win was bolstered by winning merit awards for Dairy Hygiene, Farm Environment, and Pasture Performance and the couple took out the Dairy Hygiene merit award at the nationals. Chris and Sally are in their second season 50/50 sharemilking 200 cows on Chris’ parents 80ha dairy unit in the small rural community of Karaka, just 40 kilometres south of the hustle and bustle of Auckland’s CBD. Chris says as a one-man opera tion on the farm, which includes a large adjoining run-off, part of which forms the milking platform, he is time poor and thought twice about entering the dairy awards when encouraged by his local farm discussion group. After looking at video’s about the competition and seeing the likely benefits, the couple entered the competition at the last minute. Chris says the Awards provided an opportunity to develop the business side of their sharemilking operation. He says while he was always good at the bookwork side of things, he now monitors budgets more closely, puts focus on goal setting and puts a day aside every two weeks for ‘inside farm work’. Chris says because they were committed to doing the best they could, the process of going through the awards was very demanding time-wise with many late nights and early mornings spent attaining the evidence required for judging and presenting it in a way beneficial to the judges. In the end, the effort was rewarded and had real meaning to it. “While we hoped we might pick up one of the merit awards, we had absolutely no expectation of winning our region,” says Chris. While Chris and Sally both grew up on farms – Chris on his parents dairy farm and Sally on a 4000ha sheep and beef station in central New South Wales – the couple’s dairy farming adventure really only started four years ago. In a past life Chris attained a diploma in landscape design, travelled and qualified as a carpenter, while Sally is a secondary school teacher specialising in art and design. 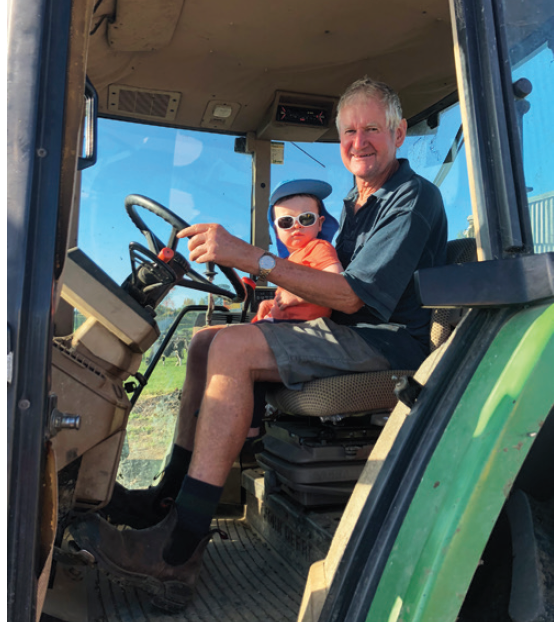 A shared love of the land, growing up in wideopen spaces and a family lifestyle afforded by farming have shaped their future which they now share with 16 month old Hunter.